If you are getting married sometime soon and you’ve already picked out your dress bravo: the most important (and stressful) part is over! Now all you have to worry about is your hair & makeup, as well as your petite bridesmaid dresses. If you & your girls are ready to dive into the flawless & fabulous world of gowns, sweetheart necklines, and chiffon fabrics, you are at the right place! Here is how to choose the best petite bridesmaid dresses! You should take into consideration the height of every bridesmaid. Are they all petite? Or are some of them tall? 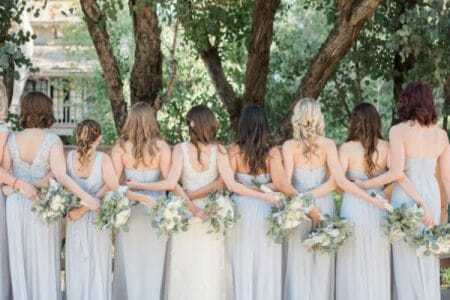 Most likely you will have a combination of petite bridesmaids and tall bridesmaids. In that case, what looks good on a petite girl may be different than what looks good than a tall girl. That will affect your decision on the dress style, color and length, as well as where to shop. The dresses most flattering to short bridesmaids usually are either long (ankle length) or short (above the knee). The long dresses will form an unbroken vertical line to make petite bridesmaids look taller. Short dresses above the knee will show off the legs and make petite women’s proportion look better. Because of the height difference, some of your bridesmaids may be petite size, others might be regular size or even tall size. If that’s the case, you should look for their dresses at stores or retailers that offer comprehensive size range. We will give you a list of retailers later in this post which carry different sizes for bridesmaid dresses. Bonus tip: when taking pictures at the wedding, make sure you ask your taller bridesmaids to stand on the sides and let your shorter girls get in the middle. 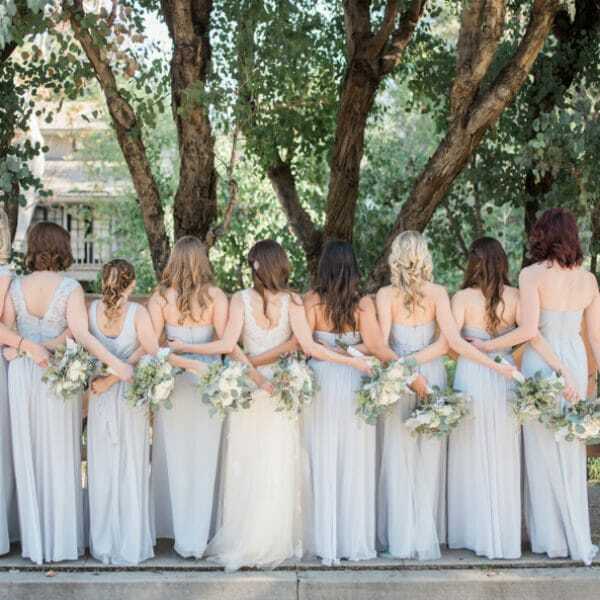 In case you have more than two bridesmaids which are taller than the rest of you, ask them to mix & match by going one tall girl next to one shorter girl etc. When choosing your petite bridesmaid dresses, you need to also think about their body type. Not everyone has the same hourglass figure. Some of your girls may have an athletic form, others could be shaped like an apple or like a pear. Because of different shoulder width, waistline and hip width, what looks good on one body type could totally look like a disaster on another. Petite Dressing has a ton of resources on petite body types and how to look good for each and every body type. If you prefer your bridesmaids to all have a consistent look, then you can consider some of the universally flattering silhouette. For example, if you are consider short dresses, fit and flare dresses generally work for any body types. If you like long dresses, the modest A line look great on most people. In terms of neckline, sweetheart neckline, scoop neck or V line are favorite picks of most girls. 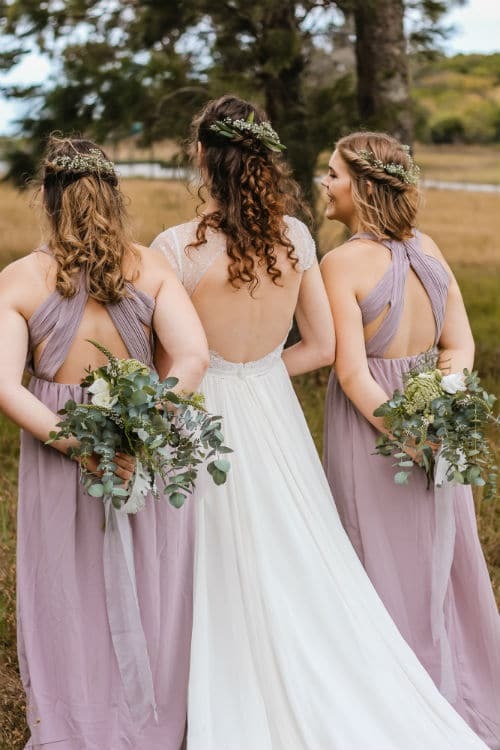 Don’t push your favorite dress style simply because it looks good on the model in the picture, but make sure it actually suits your bridesmaids and that it makes them look & feel good inside out. If you end up choosing the right style for their body type it will leave them feeling lovely which you & everyone else will definitely spot both in person and in pictures. It is important that the petite bridesmaids dresses all look cohesive with the wedding theme and that the color scheme is properly blended. That said, there is rarely one dress that fits all and makes everybody happy. In that case, you just need to happily accept the fact that your bridesmaids may have some variation in their dresses, which is totally perfect and normal. For instance, you may pick the color of the dress, and then give your bridesmaids the option to choose their favorite style. Some may like halter dresses, and others may prefer one-shoulder dresses. Or, you pick out the dress style, but let your bridesmaids to decide how long they want their dresses to be. Perhaps shorter brides want their petite bridesmaids dresses to be tailored to just the knee length, while taller brides want their dresses to reach their ankle. 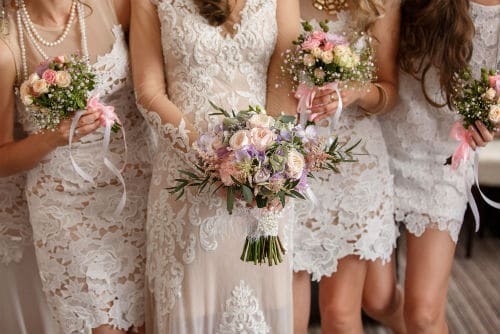 If you are open minded, even the colors of the bridesmaids dresses do not have to be identical. Some brides may have more than one theme colors for their weddings, for instance, blue and pink. In that case, having some bridesmaids wearing blue dresses and other bridesmaids wearing pink will still look cohesive with the wedding theme. Now, when it comes to fabrics, your bridesmaids may also have different preferences. Some women may feel better in silk, while others won’t like it because it can hug their body too tight and cause them to sweat, and that’s why they’d prefer cotton, chiffon, or even polyester! For most women, chiffon is always a safe bet, so make sure you discuss fabrics with each of your girls before they make their final purchase. If it is not possible to find the same dress in the fabrics that satisfy every one, then strive for finding similar dresses instead of identical dresses. In the end, it is okay if they don’t end up with the same fabric or even texture! 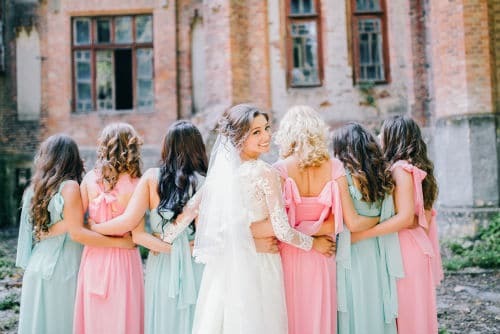 Giving your bridesmaids the option to choose and wear their favorite color, style, length and fabrics for their own dress on your wedding day will tell them how much you care about their preference and how much their choice matter to you. That goes a long way towards your friendship with the bridesmaids later in life. Don’t forget that you are the star of the show! Whatever petite bridesmaid dresses you end up choosing, they should look coordinated with your bridal gown and consistent with the wedding theme you have designed. For instance, if you are an extravagant gal and your wedding dress is show-stopping on its own, there is no reason to dress up your bridesmaids in similar prints & patterns. On the contrary, if your wedding dress is large, puffy, and covered in lace, it is best for you to play it minimalistic and safe with your girls. Look for sleek, plain, and simple dresses if you are running out of time and you can’t seem to incorporate it along with your gown. Coordinating puffy & extravagant dresses along with yours can be really demanding since you have to know how to make the fabrics coordinate, you need to have similar necklines, and you don’t want it to look too kitsch. 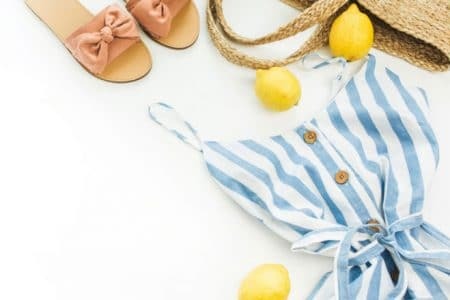 However, you can play it vice versa and dress yourself up in a traditional all-plain white gown, and ask your girls to go for dresses which are covered in prints, flowers, bright patterns, or lace. This is entirely up to you and your preference, so make sure you stick to the option which is ideal for you. One of the most important factors to think about when picking out petite bridesmaid dresses is the the weather and season for your wedding. 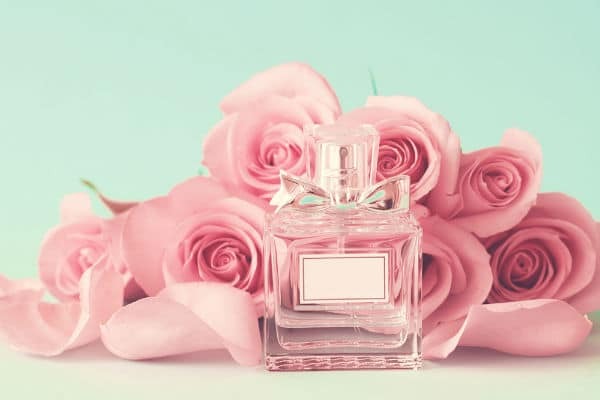 What your bridesmaids should wear in a garden wedding in the Spring could be different from what they should wear in a beach wedding in the Caribbeans. The season you are getting married and the venue of the wedding can be critical in deciding what your girls should wear in terms of the style and fabrics. No reason to go for off-shoulder mini sparkly dresses in January and have your girls freeze to death just because it looks good in the pictures, am I right? Dressing up for a wedding in winter also demands faux fur coats and shawls, as well as some thicker hosiery & fluffy scarves. Many brides prefer outdoor weddings in the summer. If this is the case with you, make sure you and your bridesmaids go for lightweight & natural fabrics. Generally speaking, what you should strive for is an ideal flow of the dress and enough space for the body to breathe. Another important consideration is if the wedding going to be indoors or outdoors. If it’s outdoors and your girls are wearing shoulderless dresses under the sun, make sure they have enough sun screen and won’t get burned. When it comes to anything related to wedding planning, starting early is key. You should discuss everything at least 3-6 months before the wedding itself! Shopping for yourself and your petite wedding gown can be stressful, but imagine adding about 3-4 of your petite bridesmaid dresses, jeez! All of you have to find time & patience for this wedding, and it is really important not to stall the process. Ordering online, tailoring, or even shopping in store will take a lot of your time, which is why you should all go out on a brunch, have your coffee, and plan the process out! You can make a deal and give each of your bridesmaids a responsibility that she could take care off. Since you are the boss bride, you can ask for help whenever, and for whatever you feel the need for. One girl can do her research on colors and what is trending at the moment, while the other one can come up with the price tags for both tailors & retailers and then present it to all of you. Plan ahead and discuss all the aspects with each of your girls, make sure you can all see eye to eye and come to an ideal and mutual agreement. Also, be open to suggestions & new ideas. Although you are the one who is getting married, it is always good to get some constructive criticism. Sleep on it, let it sink in, and then start with your definite planning. When it comes to wedding bills, it is always a sensitive yet absolutely necessary subject. Who is going to pay for them? Will it be the bride, or the bridesmaids? This is a very important question that you should bring up as early as possible with your bridesmaids. While this sounds like one of the first things you should decide, often times brides try to postpone the subject because they feel it is embarrassing to talk about money with the best pals or simply don’t know how to bring it up. While there is no rules that says brides should pay for the dresses of their bridesmaids, neither is there rule that says the other way around. So, at the end of the day, what you and your girls feel comfortable is the key in deciding the finance matter. The way you can approach this matter is by first putting together a list of what you and your bridesmaids are each responsible for financially. Once it is clear who is paying for what, it will be easier for you to come up with a solution that is fair to all. For instance, does your wedding involve traveling? Are your bridesmaids paying for their own flights and hotel? If that is the case, you may want to offer to pay for their bridesmaids dresses, because they have already taken up a big chunk of the bill from the travel. On the other hand, if you are the one responsible for their travel expenses, then it might be fair for the bridesmaids to pay for (or at least share) the cost for their dresses. If your bridesmaids end up purchasing their dresses on their own, make sure you treat them nicely with some thoughtful & personalized gifts! For instance, all of you could enjoy a weekend trip before the wedding and get some tan when at a beach, or the pool. If you don’t have enough time to pack and enjoy your getaway, try to book a massage, a spa day, or even a nail appointment for all of you! Your girls will appreciate it a lot, and all of you will end up having an amazing time, and you will definitely save some money! It is a win-win situation for everyone. If you decide you want to pay for the bridesmaid dresses, then you should think about your budget as early as possible. Every bride and groom have a budget that they don’t want to break for their wedding. Wedding is a costly event, and everything adds up. While it might seem a minor difference if one petite bridesmaid dress costs $30 more than another, but if you happen to have 8 bridesmaids then that becomes a much bigger number. Know your budget, and also communicate that early with your girls to set their expectation. Do not be shy to tell your girls and make them understand your money situation. All of you should openly and freely talk about the venue, but also about the bridesmaid’s dresses. Plan early and order early will save you stress as well as money for your big day. Sometimes getting clothes online and from some Indie sites is a lot more affordable and practical. You need to allow ample time for the shipping and possible returns. Be prepared yo might have to order multiple times from different stores in order to find the best petite bridesmaid dresses. Another benefit for the early birds is that you might be able to take advantage of the seasonal sales. If you order your petite bridesmaid dresses when stores are having holiday promotions or end of season clearance, you may be able to snap some awesome deals and get the deepest discount of the year. Here is a list of stores where you can find petite bridesmaids dresses. If you know other stores that are not on the list, please leave comments below so that we can share with other brides. They have the most choices for petite bridesmaid dresses including mini length, midi length and maxi length. As you probably know, ASOS is very budget friendly. If you have a lot of bridesmaids, you won’t worry about breaking your bank account with ASOS. They specialize in wedding related dresses (bridal gowns, bridesmaid dresses, mother of the bride dresses) and the best part is they have petite sizes for all categories. Their price level is one notch up from ASOS. Their bridesmaids dresses don’t really scream “bridesmaid”, so your girls can keep it in their closet and put them on for cocktail parties later. This is always our favorite place to shop for petite dresses. You have the choices of different designers and a wide range of price level as well. Of course, with Nordstrom, you can expect the best customer service. This is a lot of people’s favorite store and they do carry petite sizes. Their price is not cheap, but you can find unique and chic petite bridesmaid dresses here that won’t be copied from elsewhere. They carry bridesmaids dresses and we love the promotions of Macy’s every major holiday. So, if you plan it ahead of time, you may be able to snap some amazing deals for your petite bridesmaid dresses. Of course, this is the traditional bridal shop online where you can look for all things wedding related. If you have local store, it’s better to go in there and try them on.